THE HAGUE, Netherlands, Feb. 9 (UPI) — The Soviet Union’s Vladimir Lomeiko. The Czech Republic’s Vojtech Cepl. The United States of America’s Norbert Auerbach. Now, at 83, Poland’s stately Krzysztof Skubiszewski. One by one, the grand old men — of another time, of another place — are being called to their maker. They paved the way for democracy from communism. They saw the future — and believed. I was but a bit player of that time. They were my mentors. Yet again, my heart feels a heavy burden. And yet again, one of them departs almost before my very eyes. I had hoped to see Professor Skubiszewski on the weekend in the Netherlands. I was meeting with Mustafa Kamal Kazi, the noted Pakistani diplomat, former undersecretary of defense and ambassador to the Netherlands, Iraq and Russia. I had introduced Kazi to Skubiszewski and former Dutch Foreign Minister Hans van den Broek. Skubiszewski was the first democratic foreign minister of Poland after the fall of communism. I had left a message Friday. He was out of the office. Skubiszewski had been a key player in Solidarnosc — Solidarity, the Polish anti-Communist labor union movement. He and former Prime Minister Tadeusz Mazowiecki represented the academic wing of the movement. Lech Walesa represented the labor wing. The wings constantly fought, sometimes bitterly. As a result, Mazowiecki lost his rightful place in the first post-Communist Polish presidential election runoff in 1990. 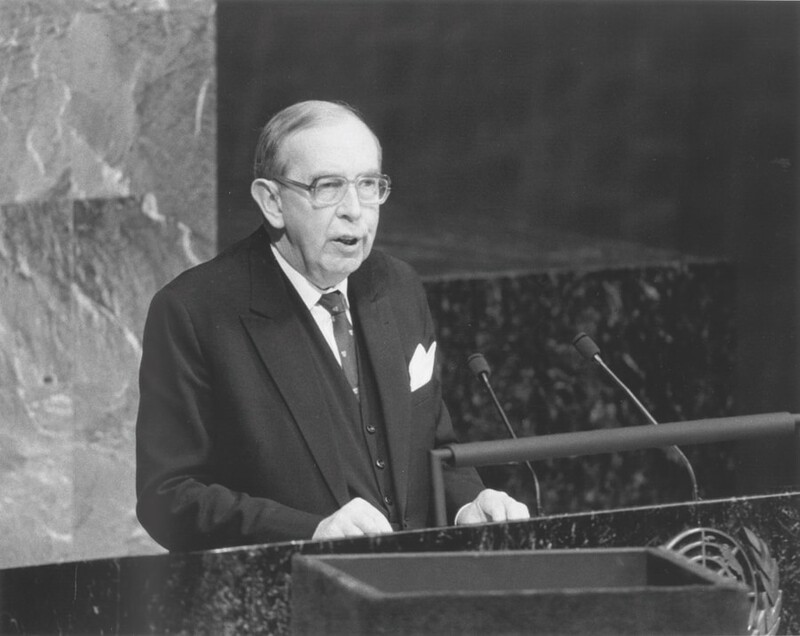 Appointed to the post of foreign minister in 1989 in the Mazowiecki government, Skubiszewski served as foreign minister in the successive cabinets of Jan Bielecki, Jan Olszewski and Hanna Suchocka. He negotiated the disputed borders with Germany, a herculean task. Over the course of his academic career, Skubiszewski published numerous books and articles on international law and received honorary degrees from many European institutions. In 2001 The Prague Society and Global Panel Foundation seized the moment to invite 27 former foreign ministers who had been in office at the fall of communism — along with Honorary Chair and Noble Laureate F.W. de Klerk, who heroically ended Apartheid 20 years ago and links it to the Cold War’s end — for three days of brainstorming at the Czech Foreign Ministry. The published retrospective contained materials previously not publicly released — the thoughts of men and women from 32 countries, what they had felt would happen, their doubts and fears. Only one of the former foreign ministers was a woman, Barbara McDougall of Canada. She would become the Global Panel Foundation’s chair for North America. Hans van den Broek was also there. It remains one of the best brainstorming sessions we have ever had. In the years after the 2001 Prague meeting, I would regularly meet Skubiszewski in The Hague. He was the president of the Iran-U.S. Claims Tribunal, established in 1981. It was one of the measures taken to resolve the crisis between Iran and the United States resulting from the November 1979 takeover of the U.S. Embassy in Tehran. A failed rescue attempt helped President Jimmy Carter lose the 1980 elections to Ronald Reagan. The Regan administration subsequently froze Iranian assets in the United States. With great hesitation President Reagan agreed to the Tribunal. Algeria would serve as the intermediary. The work of the claims tribunal was long and arduous. The Tribunal closed to new claims by private individuals in 1982 — at the time nearly 4,700 private U.S. claims. In the 28 years of its existence it ordered payments by Iran to U.S. nationals totaling some $2.5 billion, all the while sorting through masses and masses of requests for compensation, working with governments that despised each other, keeping the peace, and preventing little-boy games and sophomoric stalling attempts by the opposing sides. Being an unbiased arbiter, that was Skubiszewski’s job. It was hard work. Once Skubiszewski remarked, “They don’t need a law professor and foreign minister for this job, they need a nanny.” He looked at me and sighed. Through it all he would always keep a polite gentlemanly smile on his face. Skubiszewski was, like me, an Oxford man. He was a man of great depth. He was a man of few words. When he spoke, everyone listened. He was old school. I rarely used his first name. Once, he said, “Marc, my name is Krzysztof.” I smiled proudly but demurred with few exceptions. He would almost always call me Professor Ellenbogen. I was truly honored. Born in Poznan, Skubiszewski had — like many of his generation — survived WWII in hiding. He had lost family, and he knew and quite despised the horrors of war. As a show of respect, I rarely called him by his first name. Peering from his academic spectacles, Skubiszewski could say more with a simple glance than most anyone could say with a single word. Despite his busy schedule, he would always set aside two hours for my visit. We would meet in his office at the Tribunal building among his countless books strewn about in a professorial manner. I felt like I was in an Oxford and Syracuse Law tutorial. He was marvelous to watch; every motion seemed out of “The Paper Chase.” He was brilliant. I could not help but focus on every word he said. Often we would finish our meetings with a shot. “Today is the exception,” he would say with a twinkle in his eyes. But with Professor Skubiszewski, somehow you always felt like you could.